Touch-based WXGA ultra short-throw interactive display for classrooms. Transform your classroom into a collaborative learning space with the BrightLink 695Wi ultra short-throw WXGA interactive display. Featuring 3,500 lumens of color and white brightness1, the 695Wi delivers a dynamic, easy-to-read display up to 100" — from as close as 11" away. Turn almost any wall or existing whiteboard into an interactive workspace with touch-based interactivity — up to six users at once. 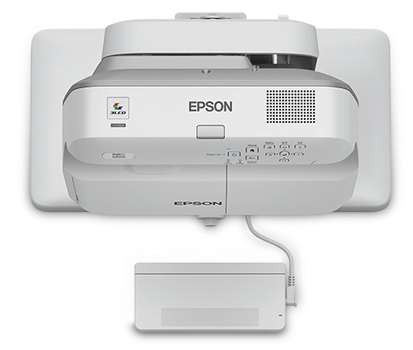 Wirelessly display content from a variety of devices — including Chromebooks — using the Epson iProjection™2 App with Moderator device management software3. Plus, it includes a 1-year subscription and support for SMART Learning Suite. Features 3500 lumens of color brightness (color light output) and 3500 lumens of white brightness (white light output). Touch, draw, select and interact using intuitive and familiar gestures. Can be mounted only 11" away from the board for a projected image as large as 100" diagonal – with no shadow interference. Dimensions: 14.5" x 15.8" x 5.9"